Belmonte at The Salk Institute for Biological Studies. Neurospheres made up of neural stem cells derived from human embryonic stem cells captured using fluorescence microscopy. 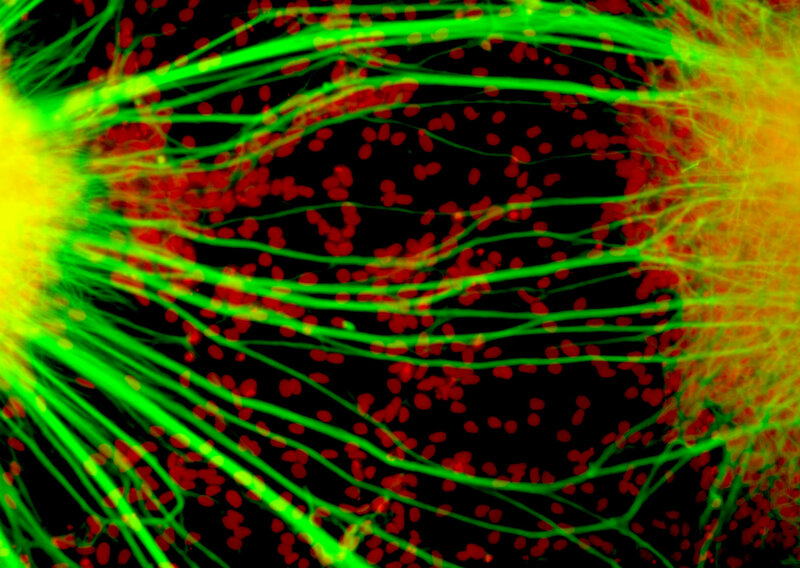 Some cells (green) are destined to become neurons; others have yet to differentiate (red) or are in transition (yellow).This photo was taken in the lab of Brian Cummings at the University of California, Irvine. 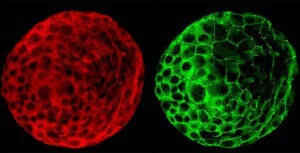 Colonies of human embryonic stem cells as seen with a fluorescent microscope. 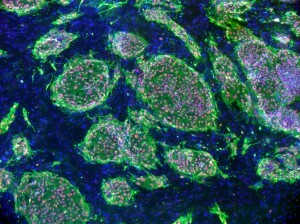 Nuclei have been stained blue, while regions that appear pink and green have been stained with antibodies, indicating the cells’ pluripotency — that unique ability of stem cells to differentiate into a variety of cell types.The image was taken in the lab of Prue Talbot at the University of California, Riverside. 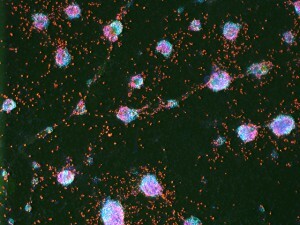 A fluorescent microscopic image of hundreds of human embryonic stem cells in various stages of differentiation into neurons. 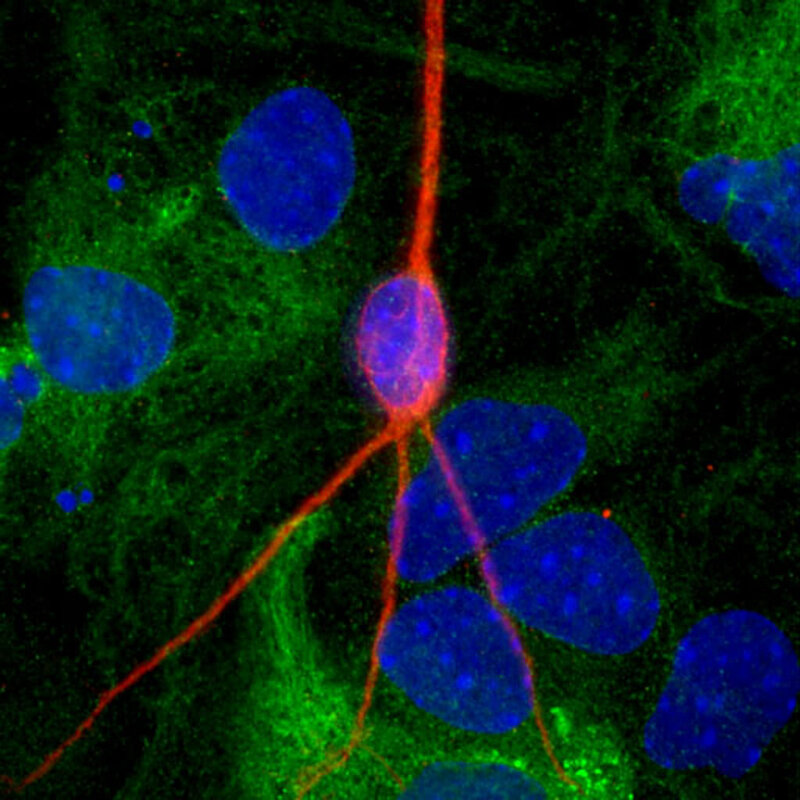 Some cells have become neurons (red), while others are still precursors of nerve cells (green). 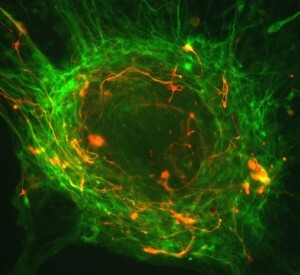 The yellow is an imaging artifact that results when cells in both stages are on top of each other.The image was taken in the lab of Guoping Fan at the University of California, Los Angeles. A composite of two images taken of a human embryo under different fluorescent wavelengths using a confocal microscope. 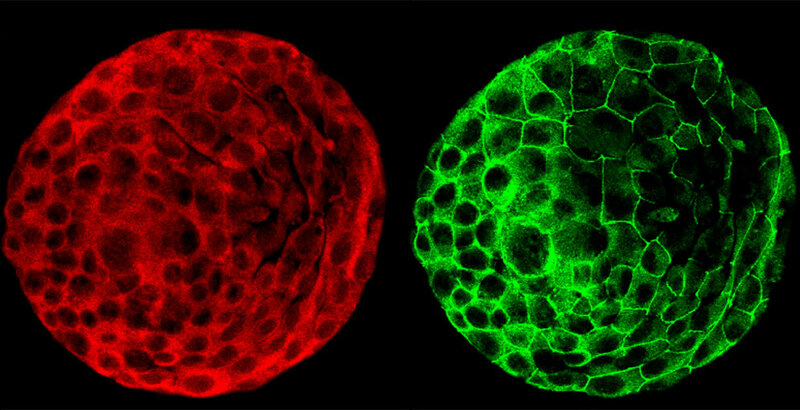 Fluorescent tags reveal that cells on the surface of the embryo are expressing human chorinoic gonadotropin (green tag) and an adhesion molecule (red tag)that helps them stick together.The image was taken in the lab of Susan Fisher at the University of California, San Francisco. Color-enhanced image taken by a scanning electron microscope of retinal pigment epithelial (RPE) cells derived from human embryonic stem cells. The cells are remarkably similar to normal RPE cells, having a hexagonal shape and growing in a single, well defined layer. These cells are the ones responsible for macular degeneration, the most common cause of blindness. 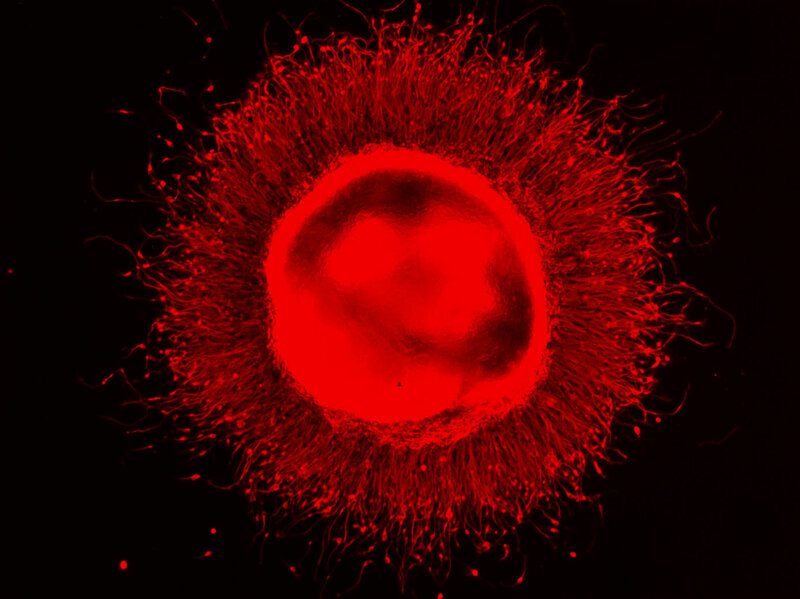 CIRM scientists hope to one day treat macular degeneration with transplanted RPE cells derived from human embryonic stem cells.The image was taken in the lab of David Hinton at the University of Southern California. 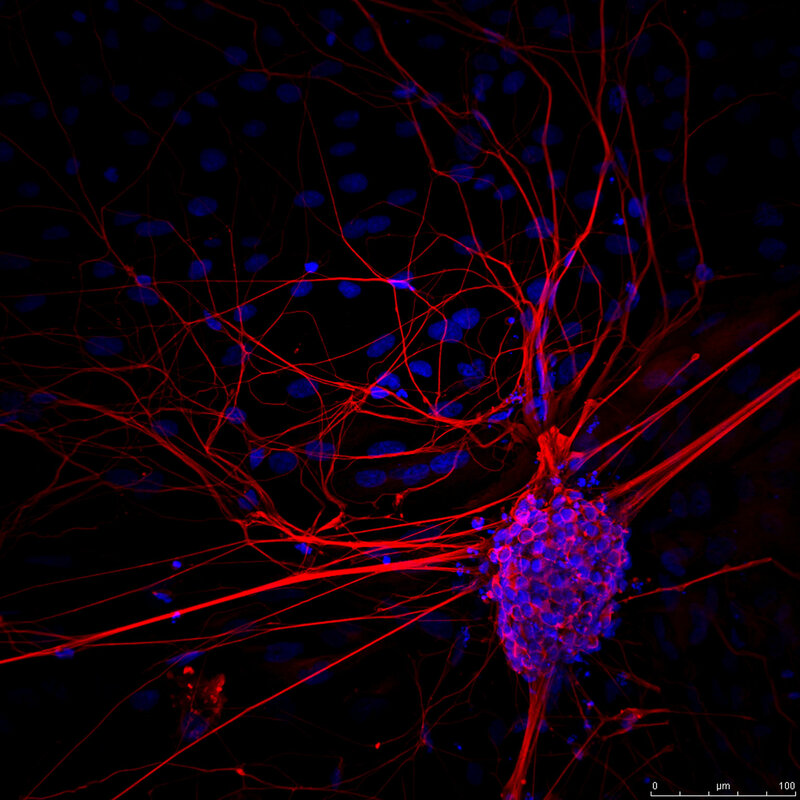 A fluorescent microscopic image of a functional neuron with an axon (red) growing above the cell’s nucleus and three dendrites (red) below. Undifferentiated neural precursor cells (blue) are visible as are glia cells (green) that have differentiated from the same group of mouse neural stem cells.The image was taken in the lab of Paul Knoepfler at the University of California, Davis. 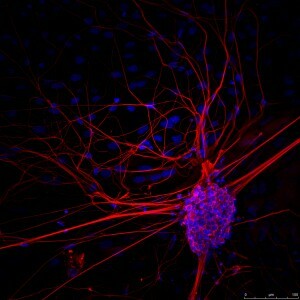 Cultured adult rat neural stem cells. 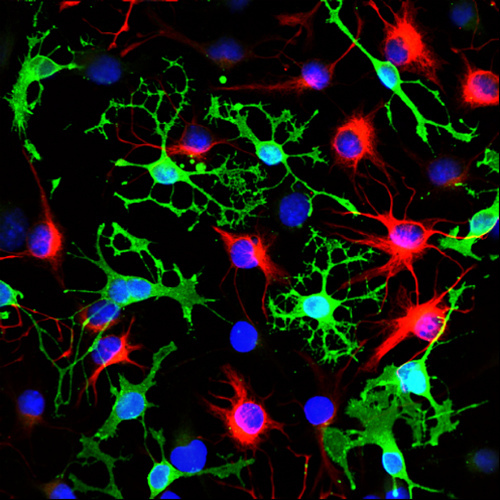 Red indicates stem cells differentiating into astrocytes, green shows oligodendrocytes, and blue indicates the cell nuclei.This photo was taken in the lab of David Schaffer at the University of California, Berkeley. 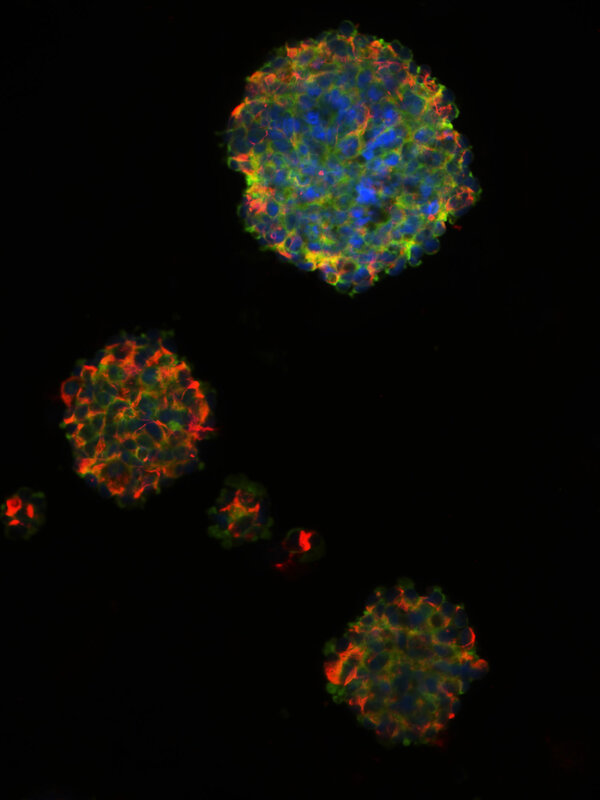 Human embryonic stem cells were differentiated into cells of the pancreas (blue). These cells give rise to insulin-producing cells (red). When implanted into mice, the stem cell-derived pancreatic cells effectively replace the insulin lost in type 1 diabetes. ViaCyte has several CIRM grants to develop a stem cell-based therapy for diabetes.This photo was taken by Eugene Brandon at ViaCyte. Neurosphere composed of neural precursor cells as captured by a fluorescent microscope. The cells, allowed to attach to a substrate, have begun to send out long processes that will eventually become the axons of the mature neurons.The image was taken in the lab of Martin Pera at the University of Southern California. 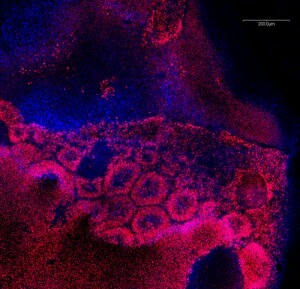 Human embryonic stem cells differentiating into precursors cells of the retina. Nuclei are in blue.Pink indicates the presence of Pax6, a protein found in retinal tissue.The retinal pigment epithelium is the tissue responsible for macular degeneration, the most common cause of blindness.This photo was taken by David Buchholz in the lab of Dennis Clegg at the University of California, Santa Barbara.